Logan Martin Lake. So you think you have seen some busy lakes in your time? Well Logan Martin is “the recreational lake” during the fun-filled days of summer. Bass anglers are hampered by all of the jet skis, sea doos, pontoon parties, sightseers and bass tournaments held every weekend. Early morning, you can usually find a few spots in seclusion, especially during the week. But once mid-morning arrives (weekends and holidays) the hordes of water vehicles emerge. This calls for patience if you intend to stay out there and fish in a crowd. Many tournaments are won with big bags of bass and lots of BIG bass are taken during the hot days of summer on Logan Martin Lake. From the mid-to-lower lake, either flipping piers or fishing river ledges with deep-diving crankbaits and bottom bumping lures, always produces quality bites. Or you can run up the lake above I-20 and have less traffic. 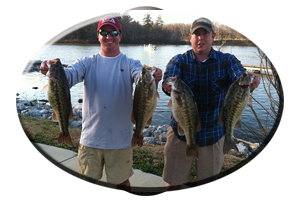 Fishing main river banks with crankbaits, spinnerbaits, buzzbaits and jig combos has rewarded many a bass tournament angler with a check. 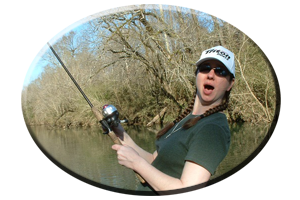 Many creeks wind far back in the hillsides and offer shade, current, cooler water, baitfish, quality-sized bass and to the angler, peace and quite. Far up the lake on the east side of the lake are many spring fed creeks. O’hatchee creek, just below Neely Henry dam, always has some current and is greatly affected when water is generated, or after a heavy rain or evening thundershower. Bass and baitfish seek the refuge of this and other creek mouths, to escape the oftentimes swift current released from upper Neely Henry Lake dam. Also try Cane Creek, Acker Creek and Alligator Creek in these lake headwaters. 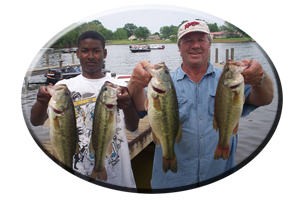 Crankbaits, rattletraps, spinnerbaits, worms, jigs and jerkbaits will take these bass, by thoroughly fishing each spot. Look for baitfish and feeding bass, especially early in the day or the during the first hour of water generation. * Schooling bass will break the surface at any time, be ready with topwater lures rigged and ready, for they don’t stay up long. Night fishing and day fishing are two different worlds on Logan Martin Lake. Gone are all the waves and water vehicles that hamper your fishing. There are night tournaments during the week but compared to daytime, the traffic annoyance is little. 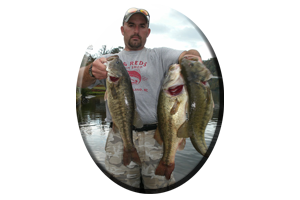 This is the time to invade the shallows (just like the bass) as you search for both spotted bass and some big largemouth’s. The spots tend to stay near deep water but can be caught in the oddest places at night. Both the spots and largemouth’s live under piers and can be caught side by side. Main lake points, submerged humps, old roadbeds, islands, flats and isolated weed patches, are just a few of the shallow spots (near deep water) these bass will forage in after dark. Weeds are homes to both species of these nocturnal bass. The spots will hang around the deeper drops, ends of piers, around deeper weed irregularities and weedy points. Largemouth’s will bury up in thick weeds, sometimes far back in the shallows at night. Catching the “spots” calls for dropping spinnerbaits along weed edges, fishing with worms or jigs, and at times a hefty spotted bass will blast a topwater lure worked along the weedy drop-offs. The largemouth’s can be fooled right up in the weeds with worms, jigs or with topwater lures drug across the weeds. Buzzbaits, frogs and rats, weed less spoons, spinnerbaits, floating worms and lizards all take some big bass during the midnight-to-dawn period and late in the evening. Evening thundershowers, so common during summer, can cool the shallows quite fast and have bass very active in a short period of time. 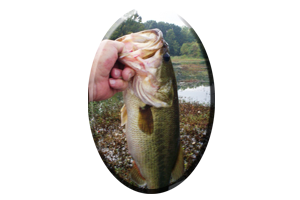 These evening showers also get the bank-running creatures active and weed less lures that mimic these bank running creatures such as worms, frogs, rats and buzz baits will be nailed. All of these nighttime tips will work throughout the summer on Logan Martin lake. As it gets hotter so will the fishing…but usually after dark.